For every beauty there is an eye somewhere to see it. For every truth there is an ear somewhere to hear it. For every love there is a heart somewhere to receive it. Life is the flower for which love is the honey. It has not been good for us these past few months. Our children had been sick, on and off. 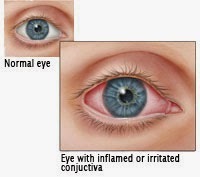 Recently they had pinkeye or conjunctivitis. My second daughter had it first, then it affected her baby sister and it got me last. I went for checkup and Doc said I had mild conjunctivitis. He gave me antibiotics, eye drop and few other medicine. My eye was red and swollen, looked like someone had punched it. We are getting better, alhamdulillah. If I remember it correctly, the last time I had pinkeye was when I am 13 years old. I did asked my girls caregiver if some other kids had it, she said none. Oh well, maybe it was the weather. The unhealthy air. Lucky for me today I am working from home, so I do not need to take any sick leave. And it is only affected my left eye. Now both my daughters have flu. Just when they are getting better, they got affected by some other illness. I spread my pinkeye to my relatives who had visited me at my parent's house the other day. I'm sorry guys, I should have warned you earlier not to come. P/S: May we all be granted with a good health. ♥ Fruitheart ♥ 2017. Simple theme. Powered by Blogger.